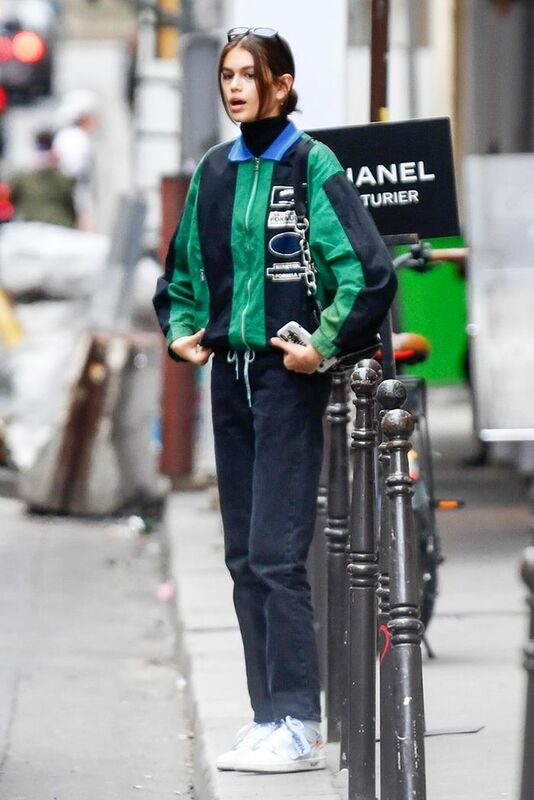 Kaia Gerber is on the move, going from Miami with her family to Paris for work, and she fittingly stepped out today at the Chanel store wearing what we're calling spring 2018's most buzzed-about trend: a windbreaker. The athleisure-inspired style has been everywhere from the Isabel Marant and Oscar de la Renta S/S 18 runways to the street style scene outside of last month's shows and on models like Bella Hadid and, now, Kaia Gerber. The retro sportswear trend is at its best when worn with polished pieces such as Gerber's turtleneck, washed-black jeans, and white sneakers. What's more, the trend doesn't have to cause harm to your bank account, and it's an easy way to jump-start your spring wardrobe with minimal effort. And if you own jeans or leggings, you're already halfway to having the perfect spring look this year. Complete the look with some of our favorite anoraks (and Kaia Gerber styling inspiration, of course) below.